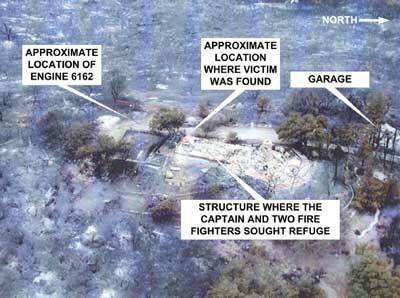 The fire was reported on Saturday, October 25, 2003, at about 1737 hours. Under the State’s mutual-aid system, a Task Force was established two days later to help combat the fire which included the victim’s Engine, four other Engines, and a Task Force Leader. The victim was assigned to Engine 6162 of the Task Force. Engine 6162 was dispatched at 2130 hours on October 27, 2003 and headed for a rendezvous site with the Task Force Leader and two other engine crews. The Task Force Leader and three engines left the rendezvous site at approximately 2359 hours. A third engine crew was met en route. The crews drove the 500 miles to the incident base site where they arrived at approximately 1100 hours on the morning of October 28, 2003. The task force was in the staging area approximately three hours before receiving an assignment (at 1400 hours) to provide structure protection. A fifth engine (Type I) crew was assigned to them at this time. The task force worked with a number of crews providing structure protection until they were relieved to return to the incident base at approximately 2130 hours. On October 29, 2003, the Task Force leader attended the morning briefing at 0700 hours. The crew was assigned to a Branch and Division on a flank of the fire. The Task Force Leader met with the Division Supervisor at this time for any additional instructions and information. The Task Force Leader then met with his crews and briefed them on their assignment before proceeding to the rendezvous point (approximately 40 miles from the staging area) where they would meet with the rest of the Division (Photo 1). 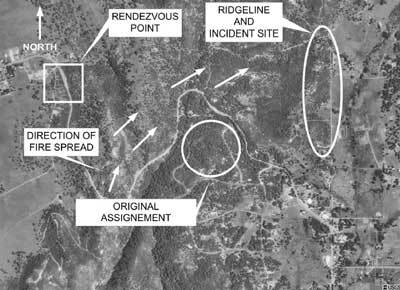 The task force arrived at the rendezvous site and was assigned to provide structure protection. 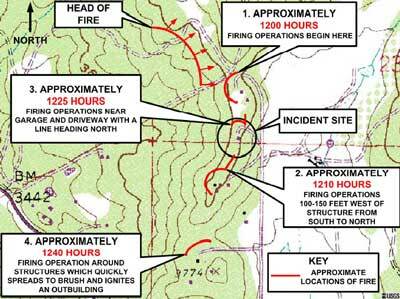 The Task Force Leader then received a map and debriefing from a Strike Team Leader that had been working in the area. Fire fighters reported to NIOSH investigators that the fire at this time was moving slowly with spot fires on both sides of the state road. The crews began mopping up operations in a small subdivision on the south side of the road before receiving a new assignment at 1100 hours (Photo 1). At approximately 1150 hours, the pilot of Helicopter 523EH noticed spot fires near Residence #1. The helicopter operation was then moved to the ridge on the east side of the drainage where they are assigned to protect structures. The Task Force Leader arrived at the ridge and begins to size-up the structures, beginning with Residence #1. At approximately the same time, a California Department of Forestry (CDF) Captain and a Fire Apparatus Engineer (FAE) arrived on the ridge in a pickup truck (Utility 3334) and drive to Residence #1. 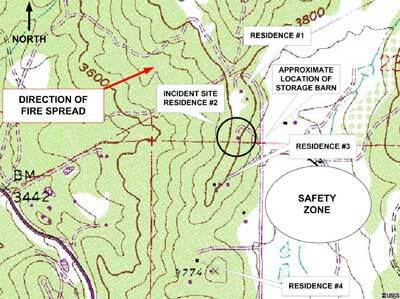 At approximately 1200 hours, most of the crews arrived at the ridge where they would provide structure protection (Map 1). The single lane dirt road runs along the east side of, and parallel to, the ridge top. There is a large open field to the east (designated as the safety zone). There were four separate residences (Residence #1, #2, #3 and #4), a water tower near Residence #1, and a storage barn along the east side of the road (Map 1). The Task Force Leader determined that he was going to red flaga Residence #1 and Residence #3 as he deemed them “not saveable.” Engine 334 was not with the Task Force at this time as they had headed into the nearest community searching for a hydrant to refill their Engine’s water tank. The Task Force Leader drove to the end of the single lane dirt road to conduct his size-up in determining where to deploy his crews. The CDF FAE begins firing out around Residence #1 while the Captain proceeds in Utility 3444 down the dirt road. Map 1. Aerial view of drainage and incident scene. At approximately 1215 hours, Engine 6162 was assigned to protect Residence #2 (the incident site) and Engine 24 to protect Residence #4. Engine 5214 was staged at the storage barn along the east side of the road. A Hotshot crew and two bulldozers arrived at Residence #1 with part of the Hotshot crew and one of the bulldozers beginning direct perimeter control in that area. Engine 6162 crew proceeded up the driveway of Residence #2 while the victim and a fellow crew member cleared overhanging brush near the driveway. The driver positioned Engine 6162 approximately 60 feet to the south of the structure (Photo 2). The Engine 334 crew was staged at the storage barn when a CDF Captain (the same captain that had met with the Task Force Leader) approached the Captain from Engine 334. The CDF Captain informed him that he had already begun burnout operations near Residence #1 and that if they didn’t get up there soon they would lose the structure. The Engine 334 Captain radioed the Task Force Leader for further instructions. The Task Force Leader ordered them to head up to Residence #1 to see what they could do. The Task Force Leader proceeded down the driveway to the dirt road heading toward the storage barn where he saw bulldozers heading toward the north end of the ridge and Residence #1. The Captain of Engine 6162 determined that the site was defensible due to the large cleared area (approximately 150 feet of brush) around the west side of the residence (Photo 2). The Engine 6162 crew had a clear view of the west and northwest. Tall brush and drifting smoke obscured their view to the southwest. They observed smoke from the fire to the north which was flanking towards them and posed the greatest threat to their position. 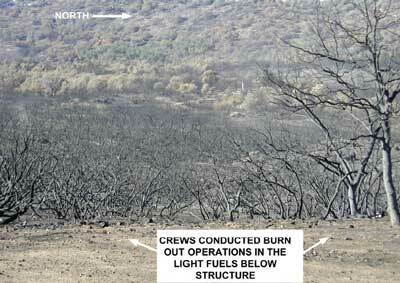 Small runs of fire were taking place across the canyon on the west side of the drainage (Map 1 and Photo 1). The crew also noted an up-canyon and up-slope wind, at about 7-10 miles per hour. The crew decided to clear the grass and brush (manually and with fire) below the house. Two fire fighters from Engine 6162’s crew were now using drip torches to burnout the grass below Residence #2 (Photo 3). The victim manned a 1 ½-inch handline while burning a brush pile near the Engine while the Captain used a drip torch to burnout the vegetation near the driveway. Fire could be seen to the north and west of their position where three helicopters were making bucket drops. At approximately 1225 hours, the CDF Captain and FAE arrived in a pickup truck and began lighting fire near the garage without speaking with the Captain from Engine 6162 (Photo 2 and Map 2). The Captain from Engine 6162 saw the CDF Captain and fire fighter and believed that they had seen him near the house. Approximately 15 minutes later, the crew noticed that the fire activity below them was beginning to increase. The Task Force Leader was coming down the driveway after red flagging Residence #3 when he ran into the CDF Captain and fire fighter that had been seen earlier at Residence #2 by the Captain from Engine 6162. 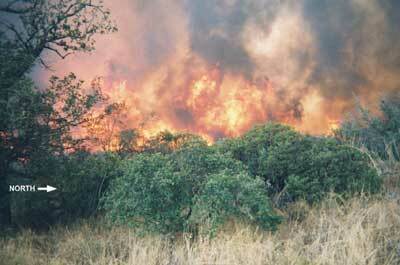 The CDF Captain told the Task Force Leader that “they need to put some fire on the ground or they’re going to lose the houses.” The CDF Captain and fire fighter, carrying a drip torch, headed into the brush just to the north of Residence #3. The Task Force Leader reported to NIOSH investigators that flames, 10-15 foot tall, could be seen in the brush just minutes after the CDF Captain and fire fighter entered the brush. The CDF Captain and fire fighter then came out of the brush, got into their truck, and drove away without any further conversation with the Task Force Leader. The Engine 6162 crew began to observe an increase in fire activity down slope from their location as fire was now making an up-canyon, up-slope run in the heavy brush and oak fuels (Photo 4). The fire was wind driven and was making a continuous run toward Residence #2, covering a distance of approximately one-half mile in about two minutes. The Engine 6162 crew gathered behind their Engine as the fire intensity increased. The victim manned a 1 ½-inch handline at the rear of the apparatus while another fire fighter manned a handline at the front. The fire fighter on the handline at the front of the apparatus had to extinguish the juniper bushes on the patio behind them as hot embers began blowing into the brush near the residential structure. Conditions were beginning to deteriorate quickly as the smoke began reducing visibility and the heat intensified. The crew members reported to NIOSH investigators that the sky began to glow orange and that the heat appeared to be coming from the south or southwest (behind them). There was a significant increase in the wind as the flame front blew across the driveway near the garage cutting off their escape route (Photo 2). The ornamental bushes between Engine 6162 and the house began to burst into flames. The Captain ordered the crew to seek refuge inside the residential structure. The fire fighter and driver/operator ran for the patio that led to the rear of the structure, broke out a window of the back door and reached inside to unlock it. The Captain noticed that the victim was not following them. He turned back to look for the victim, who was still standing near the rear of the apparatus, and noticed that the victim appeared to be disoriented. The Captain yelled for the victim to move to the structure. The victim was slow to respond to the Captain’s order and actually appeared to begin walking in the opposite direction. The Captain continued to yell to the victim before the victim turned and began walking toward the Captain. The victim had only taken a couple of steps before he fell to the ground. The victim was able to stand back up under his own power before he turned and walked toward the tailboard of the apparatus. The victim then turned and fell into the burning bushes (ornamental shrubs planted by the homeowner) near the patio. The Captain grabbed the victim and assisted him toward the structure. The victim was moving under his own power but appeared to the Captain to be slightly hunched over at the waist. The Captain heard the victim reply that he was “burning up” but the Captain did not see any visible fire on the victim. The victim fell for the final time as he and the Captain reached the patio along the south wall of the residential structure. The victim fell to his knees and landed face down without any attempt on his part to brace his fall. The victim was unresponsive as the Captain attempted to move him. The Captain made a radio transmission stating that he had a “fire fighter down.” It was at this time that the Captain began receiving the majority of his burn injuries. The Captain dropped his portable radio as it became too hot to hold and was forced to retreat to the rear of the structure where he was met by his fire fighter and driver/operator. Fire was now reportedly blowing over the patio with such intensity that no further attempts to find and assist the victim were feasible. The Captain, fire fighter, and the driver/operator sought refuge in the house. Additional attempts were made to look for the victim but the intense heat forced the crew members back inside the structure. The driver/operator was eventually able to make it to the Engine where he grabbed the handline and attempted to extinguish the fire on the patio where he could see the victim lying face down (Photo 2). He quickly ran out of water as the hose at the rear of the engine had burned through and the tank had been pumped dry. The driver/operator went back inside the structure that was now burning with the interior filling with smoke. They decided to make a run for the Engine where they were able to escape as the driver/operator drove Engine 6162 down the driveway to the single lane dirt road. They proceeded south along the dirt road where they met up with a Hotshot crew. At approximately 1310 hours, advanced life support ambulances and medical helicopters were requested. The Captain, fire fighter, and driver/operator were transported, via various helicopters to the county burn center for treatment. The victim’s body was recovered from the scene the same day. Crews from the Task Force operating to the south and north of the incident site reported that they too had experienced extreme fire behavior at approximately the same time as the fatal event. The Engine 334’s crew assigned to Residence #1, and Engine 24’s crew, assigned to Residence #4, also reported experiencing a very similar situation to that of the Engine 6162’s crew. Their escape routes had been temporarily cut off as the intensity of the fire from the firing out operation increased. Engine 334’s crew reported to the Task Force Leader that their visibility was extremely limited and that there were numerous spot fires in their area. The Engine 334 crew was able to use handlines to protect themselves while CDF helicopters made bucket drops on the fire and a dozer cut a line increasing their defensible space. They were eventually able to escape without any serious injuries. a An agency practice identifying those structures requiring too many resources (e.g., manpower, equipment, time, etc.) to safely and effectively mitigate prior to the fire's arrival. The death certificate and autopsy report were completed by the County’s Office of the Medical Examiner. The report listed “thermal injuries” as the cause of death on October 29, 2003. Significant findings from the autopsy included extensive burns over the entire body, no evidence of underlying cardiovascular or pulmonary disease, and a carboxyhemoglobin level of 27% (confirming significant exposure to carbon monoxide prior to his death). The victim had a history of “allergen induced asthma” that seemed to have seasonal exacerbations. The condition was first diagnosed in 1999 by his personal physician and subsequently shared with the physicians providing occupational medicine services to the Fire Department. He was prescribed bronchodilators and steroid inhalers for his asthma which could be considered mild because he never required any of the following: hospitalizations, emergency medical care (e.g. a hospital emergency department), oral corticosteroids, or work restrictions. In August, 2003 the victim had his lungs tested as part of the fire department’s annual medical evaluation. Off medication, his pulmonary function tests were completely normal (FEV1 was 99% and his FVC was 96% of predicted values for someone of his age, height, and gender).